Bank of Palestine has secured a €12.5mn credit line from the French development agency AFD for the financing of green and renewable energy projects in the West Bank and Gaza. The facility is aimed at developing a market for green investments in Palestine by giving Palestinian enterprises, in particular SMEs, easier access to green finance. Bank of Palestine will on-lend the money to projects related to environmental efforts and renewable energy. It will also target retail, industrial, tertiary and agricultural sectors in order to replace high energy consumption equipment. This includes supporting hotels, offices, hospitals and supermarkets in saving energy and reducing water consumption. In the agricultural sector, it will promote energy efficiency in irrigation and biogas technology. A focus on green and renewable energy is essential to secure future energy sources in the Palestinian territories, which today rely heavily on Israel for their electricity imports, and energy costs more than anywhere else in the Middle East. Researchers have found Palestine’s main renewable energy sources to be solar energy, wind energy and biomass, which could significantly reduce the energy dependence on neighbouring countries. 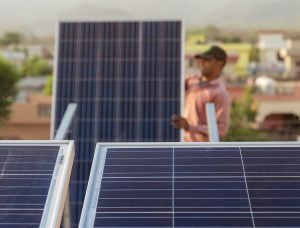 The green credit line was agreed under AFD’s green finance programme Sunref, a scheme that provides local banks with long-term loans on favourable terms. It also offers technical support, assisting banks in project financing and helping companies implement green strategies. Bank of Palestine has previously partnered with AFD under the Ariz loan guarantee programme, an instrument by which AFD provides up to 50% credit risk cover on corporate loans. Starting in 2014, the programme has so far financed 255 projects worth a value of between US$20,000 and US$300,000. Bank of Palestine is the West Bank’s largest financial institution and lender to SMEs, a sector that represents 90% of the Palestinian economy. In the last 10 years its assets have grown from US$500mn to almost US$5bn, according to the bank. The post New deal to bolster green investment market in Palestine appeared first on Global Trade Review (GTR).